Everyone, including myself, was surprised at the number of defensive ends the Eagles drafted. That was the big story, especially because it seemed like the secondary and the offensive line were bigger needs. But when you look at the offseason in hindsight, it’s easy to see that there were big needs there. The group wasn’t in any way dominant last year and we heard that some of the veteran guys were poisonous in the locker room. In any case, the Eagles jettisoned three players (Darren Howard, Jason Babin, and Chris Clemons) who combined for over 900 snaps. Essentially, they needed three more bodies — hopefully younger and more productive ones. Not only was it a need, but you can see where each new DE fits a certain role on the team and, in some cases, specifically replace one of the departed veterans. Andy Reid compared Brandon Graham to Trent Cole, and he will get every chance to star opposite Cole for the next 5-10 years. Andy said Daniel Te’o-Nesheim will step in for Howard, as a DE who can move inside. Ricky Sapp replaces Clemons at the Joker spot. Darryl Tapp (while not exactly the same type of player) sounds like will take the place of 31 year-old Juqua Parker when he eventually gets cut/traded. The Eagles only have 7 DEs right now (prior to UDFAs) on their roster. They played with 6 last year, so it’s not like the team is overloaded. Last point on DE: It seems like McDermott may be in the same school of thought as Steve Spagnuolo when it comes to defenses — get as many pass rushers as possible. That’s how Spags managed the defense in New York when they won the Super Bowl, and it may help explain the focus there rather than on the secondary or linebacker corps. Nate Allen looks like a real solid, mature kid. Check out his press conference if you haven’t already. I will honestly be surprised if Allen’s not starting at FS come September and he has a great chance to be a new leader on the defense. If Allen solidifies the starting free safety spot, as he will be given every opportunity to do, I could see the Eagles making Quintin Demps the back-up and moving Macho Harris over to corner. He, Marlin Jackson, Ellis Hobbs, Joselio Hanson, and 4th round pick Trevard Lindley will get shots at the RCB job (which now looks like the 2009 FS position). Then if Jackson or Harris loses the battle, the Eagles could stash them back in the other back-up safety spot. As Scott Turnstall over at Inside the Iggles sharply noticed, all 13 players the Eagles drafted were seniors. Last year the top of the draft had two young underclassmen and that seemed to work out fine, but you have to wonder if this is a new Howie Roseman philosophy. Additionally, only TE Clay Harbor from Missouri St. came from a smaller school. There were no unheard of projects from Cal Poly or McNeese St. this time around. While we’re on the tight end position, don’t be surprised if Harbor sees more playing time than Cornelius Ingram on the depth chart this year. Andy had high compliments for his blocking skills and, unlike Ingram, Harbor doesn’t have balky knees. It still amazes me that the Eagles didn’t take an Offensive Lineman in this draft. Everyone agreed that it was a need — except the Eagles. Andy doesn’t even need excuses to take big uglies, but he’s willing to got to war with that depth? Nick Cole and Stacy Andrews don’t worry me that much but who do you trust if someone gets hurt again? Jean-Gilles, Dunlap have showed us very little. McGlynn, Tupou, Reynolds haven’t even been on the field before. The Eagles will bring in some UDFAs, but it’s surprising that they don’t feel the need to bring in real competition for a guy like Dunlap. Andy’s response about whether there has been any interest from other teams for Michael Vick: “No.” Reid didn’t seem too pleased with the development. Could Vick really not be going anywhere? I bet the Eagles are still hoping someone like Buffalo decides they need Vick, or another team’s quarterback gets hurt. Anyone else notice how much Andy went out of his way to heap praise on Howie Roseman’s shoulders? We know Reid is the final decider in the room, but he’s a real underrated leader — pushing off the success on other people and accepting blame when it comes. The Eagles drafted 13 (!) players — the most ever by a team in the 7 round format. Can they keep them all? I’m going to do a preliminary roster analysis soon but my quick answer is yes. It depends on roster battles and injuries, but the Eagles got rid of so many older players that they’ll open up camp with a lot of space. The fact that the Eagles only selected one player at their own pick (outside of compensatory selections) is also astounding. Howie certainly learned the art of trading from Heckert. Stewart Bradley and Alex Hall are the only two big linebackers. Everyone else is small and fast. We’ll see about the SAM spot. Fokou looks like he’s going to get the first crack at the job (ala Quintin Demps in 2009) but if he can’t step up it could be another mishmash of guys from Akeem Jordan to Hall. Also, if I were Omar Gaither or Joe Mays I’d be worried about my job. The two draft picks look like almost-identical replacements to me. I think the arrival of Charles Scott means Eldra Buckley is a goner. Buckley may be a better special teamer, but Scott will get a chance there since he’s probably viewed as a long-term change of pace back to LeSean McCoy. Obviously they’ll be battling it out for that 4th RB spot. 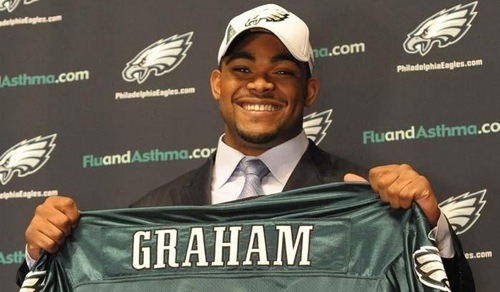 The Eagles already have 9 picks in the 2011 draft. Unbelievable. Last chance for Trevor Laws. Jeff Owens is only a 7th round pick, but considering the move toward using DEs inside on passing downs, it’s unlikely the Eagles keep more than 4 DTs. Patterson and Bunkley are solid, and Antonio Dixon showed a lot of promise last year. It’ll be Owens, Laws, and another UDFA or two competing for the final spot. Mike Kafka is right out of the AJ Feeley playbook. Both 6’3”, 220 lbs, mediocre arm strength, significant college back-up experience. I anticipate he’ll do fine in Feeley’s role. Update: Bye Dawk at Bleeding Green Nation chronicles how the Eagles got 5 players and a 2011 draft pick for their second 2nd rounder. Impressive job, Howie. Tagged with Philadelphia Eagles, 2010 NFL Draft, Wrap-Up, Analysis, Defensive End, Brandon Graham, Nate Allen, College, Michael Vick, Trades, Linebacker, Offensive Line Depth, Mike Kafka, Back-Up, Andy Reid. April 25, 2010 by Brian Solomon.